If you're like most Americans, chances are you've visited a zoo. Maybe you've only gone to one on a school field trip, or maybe it's one of your favorite places to go, but whatever the case, zoos are popular in this country. As of March, there were 224 Association of Zoos and Aquariums (AZA)-accredited zoos in the United States. As prominent fixtures of American life, zoos are also serious targets of criticism and speculation due to the perceived moral and ethical dilemmas of keeping animals in cages or enclosures under the care of humans. Granted, sometimes zoos actually save animals' lives and help turn around the health of an endangered species. But for all the good, there are still plenty of questionable things that happen at zoos. So before planning a trip to see the newest exhibit at a zoo near you, here are 11 things you need to know. 1. Many zoos claim they are conserving animals, but often times, aren't doing so at all. Many of the AZA-accredited zoos are part of the Species Survival Plan (SSP) Program, which hopes to foster endangered species and promote breeding. However, these efforts rarely prove successful, and sometimes aren't happening at all. David Hancocks, a former zoo director with 30 years of experience, told National Geographic that he thinks less than three percent of a zoo's budget goes towards conservation efforts, with the remaining percent going towards "hi-tech exhibits and marketing efforts to lure visitors." While some zoos simply don't devote a significant enough of their resources to conservation, the efforts of some of those that claim to be committed to conservation are undermined by disturbing findings about the animals in their own facilities. The Seattle Times conducted an investigation in 2013 that looked at the success rate of "saving" and breeding elephants in 390 U.S. facilities over 50 years. They found that "most of the elephants died from injury or disease linked to conditions of their captivity," such as foot problems from having to stand on concrete surfaces and musculoskeletal disorders from not getting enough exercise. The investigation came to the sobering conclusion that the overall infant-mortality rate for elephants in zoos falls at 40 percent. In public, however, the AZA frequently avoids mention of the health of their captive elephants, instead choosing to tout their broader conservation efforts for the species. 2. On the topic of elephants, 40 percent of all African elephants in U.S. zoos are obese. And it negatively affects their rate of reproduction. Since a high body mass index in elephants is strongly related to "abnormal ovarian cycles," this issue deeply threatens the initiative to breed more African elephants in captivity. A 2011 report by researchers at the Lincoln Park Zoo in Chicago states that the total elephant population at U.S. zoos needs to average about six births a year to remain stable. However, they currently average just three births a year. 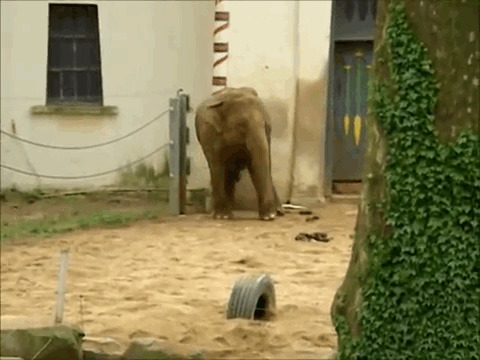 Daniella Chusyd, a doctoral student in the University of Alabama at Birmingham Department of Nutrition Sciences, speculates that "zoos will need to rethink how they house and feed elephants to reduce the incidence of overweight" animals. 3. The "habitats" most zoo animals are housed in barely even resemble their natural environments. David Hancocks, a noted zoo architect and advocate, spoke with National Geographic about the man-made enclosures that hold zoo animals and doesn't have great things to say about what he has experienced in his work. He states that zoos have operated under the presumption that they are creating a "landscape immersion design," which is the idea that "the animals should be immersed in landscapes that represented as closely as possible their natural habitats, and that the human visitors should also be immersed in the same replicated habitat, experiencing it with all their senses." Instead, what ends up happening is animals are forced to reside in habitats that are completely foreign to them, including plastic or concrete trees and illusions of real grass or dirt that masks hard concrete below. In short, Hancocks says, "Everything they touch except their food and feces is unnatural." 4. Which may help explain why many of the movements you see animals make in their enclosures are serious signs of anxiety and depression. 5. That animal you see may only appear happy because he's on antidepressants. If you think humans are the only animals who receive counseling and medication, think again. In her book, Braitman tells the story of a polar bear named Gus who resided at the Central Park Zoo in the '90s. For 12 hours a day, he would repeatedly swim figure eights in his pool and stalk children who came to look at him through the glass of his enclosure. This earned him the nickname "the bipolar bear." He was also put on a steady dose of Prozac and received $25,000 worth of behavioral therapy. The practice of putting zoo animals on antidepressants is startlingly common, according to Braitman. However, the exact number of animals on medication is unknown, since many zoos want to avoid presenting the image that their animals are not "happy" and "content." However, Braitman told Slate, "At every zoo where I spoke to someone, a psychopharmaceutical had been tried." And just this February, at the British Scarborough Sanctuary, penguins were given antidepressants to bolster their moods after becoming distressed dealing with strong weather that included intense winds and lashing rains. While wild penguins would be able to adequately deal with the weather, those who were born in captivity responded with high anxiety and stress. 6. Animals are often moved around different zoos, which disrupts their pack units. Zoos believe they are doing something good for endangered species when they decide to move an animal from its original zoo and send them to a completely different one for breeding purposes. Yet they often end up disorienting the animals and placing them in upsetting new situations. Some zoos are completely transparent about another motive for moving their animals around. The Milwaukee County Zoo states on their website that one of the reasons they move animals is to keep their collection "fresh and exciting." In her book, Braitman tells the story of gorilla who was moved from his home zoo to another because he was a suitable genetic match for a potential mate at a different zoo. Once he arrived at his new enclosure, the other gorillas abused him and alienated him to the point where he became so depressed that he lost a third of his body weight. He was then sent back to his original zoo to be nursed back to health, only to be sent to another different zoo to live. When his original zookeepers came to visit him at his new home, the gorilla "ran toward them sobbing and crying." 7. And some zoos refuse to move animals who desperately need to be in a different environment. Arturo is the last captive polar bear in Argentina. And he's pretty sad. He lives at the Mendoza Zoo in Argentina and all day he "paces nervously." The problem is that Arturo does not belong in the hot temperatures of Mendoza, where it can get up 86 degrees during the summer. That might explain why the last polar bear in Buenos Aires died in December 2012 during a heat wave. There is currently a petition with more than 500,000 signatures on Change.org asking the Argentine President Cristina Fernandez to move the bear, and even former U.S. House Speaker Newt Gingrich has urged people to sign it. However, the zoo director has said that the zoo will not move the bear due to his old age (he's 28) and the risk associated with having to sedate him. Looks like Arturo is destined to live out the remainder of his life in misery. 8. Some zoos don't have the resources to properly take care of their animals. 2013 was not the best year for the National Zoo in Washington D.C. Three animals died and a zebra attacked a zookeeper after he didn't follow proper protocol. When asked about the cause of these issues, the zoo's director credited it to the zoo's lack of resources and the staff being "spread too thin." The cause of death for one of the animals who died, a female red river hog, was due to "improper nutrition." When she arrived at the zoo she weighed 110 pounds. Shortly after living at the National Zoo, she died weighing only 79 pounds. The National Zoo has been charged with a few internal reviews urged upon by Congress to look into the care that is being given to the animals there. In 2003, internal reviews urged upon by Congress to look into the care that is being given to the animals found that the zoo has suffered a "decade-long decline in facilities, animal collection, and quality of animal programs." And in 2013, two internal reports stated that "animal care and overall organization, accountability, follow-up and communication" were "severely lacking" in the zoo's cheetah exhibit. A biologist position that was needed for the cheetah exhibit was left empty for several years due to budget cuts. The job was was finally created by switching an animal-keeper's job to include the responsibilities of a biologist. The Guardian reports that this quick fix was "recommended against," as it would work against keeping "adequate staffing" in tact at the zoo. 9. In fact, some animals have very expensive specific diets that zookeepers hardly understand. A panda at the National Zoo eating a fruit popsicle in the summer of 2011. The specific diets that many animals can easily obtain in the wild by themselves have always proven to be a problem for zookeepers. In 1988, a New York Times article highlighted the challenges zoos face when deciding what and how to feed the animals. Oftentimes, zoos must spend a lot of money hiring nutritionists to finesse the perfect diet for endangered species, while horticulturists are brought on to cultivate and deliver specific plants to the animals. For example, one horticulturalist's sole job at the San Diego Zoo is to provide the 16 different species of bamboo that the giant pandas must eat in order to survive. Because it's virtually impossible (and financially difficult) for zoos to create an exact replica of the animals' natural environment, they have devised ways to infuse specific nutrients and vitamins into pellet-type foods for the animals. These substitutions can have grave consequences. In 2011, after years of feeding gorillas a high-sugar and high-starch diet, the Cleveland Zoo had to desperately start working on a new food plan for their gorillas who were dying of heart failure, a result of heart disease, the number one deadly disease of Western lowland gorillas in U.S. zoos. They have started feeding the gorillas romaine lettuce and "bananas stuffed with multivitamins." 10. The truth is, many zoo visitors aren't interested or aware of the well-being of the animals they're seeing. A study that focused on visitors' behavior at four different zoos in the Western U.S. with underwater exhibits found that 86 percent of the visitors said they went to the zoo for "social or recreational purposes," and only six percent said they go to a zoo in order to learn more about animals. In another study done on visitor behavior at an ape exhibit at the Lincoln Park Zoo in Chicago, it was revealed that both adult and children visitors "spent significantly more time watching apes than reading interpretives." The study also showed just how much people antagonize and harass the animals. Of 350 people, 78 pestered the apes by knocking on the glass or expressing other types of "undesirable behavior." 11. If you want to see wild animals, you should seek a place where you can view animals who are not caged. A mother polar bear and her cub play in the wild in Barter Island, Alaska. Benjamin Wallace-Wells recently wrote an op-ed in New York Magazine titled, "The Case For The End Of The Modern Zoo," in which he states that the major moral dilemma that seems to exist today with zoos is the idea that they are creating a "double illusion" both for humans and for animals. He writes that "People are convinced that they are seeing animals in something like their natural state and the animals, most of whom have never lived in the wild, are convinced that they are at home." However, Wallace-Wells emphasizes that the illusion is far worse for the animals, who seem to be somewhat aware that their environments are complete fabrications and are apt to resist the unnatural human interaction they are forced to deal with. He speculates that America could be inching toward a move that Costa Rica just implemented: a plan to close all zoos and "open the cages where animals have been kept." So, if you want to go see some wild animals who are living outside of cages and as close as possible to how they would in the wild, you should seek out a nature preserve. A good place to start would be visiting The Nature Conservatory's website which lists all the grasslands, coral reefs and habitats you could visit. Correction: An earlier version of this story incorrectly stated that Arturo was the last captive polar bear in the world. He is the last polar bear in Argentina.